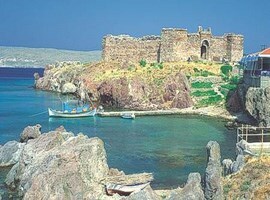 Lesvos is fairly considered as the island of harmony and the beauty, of the literature and the cultural prosperity. Lesvos Island with an extent of 1.632 km2 is the third in size island of the Aegean Sea, after Evia and Crete. It is 188 nautical miles from Piraeus, 218 from Thessaloniki, 55 from its neighbour island Chios and impresses the visitor with its beautiful olive groves and the beaches that dispose of. 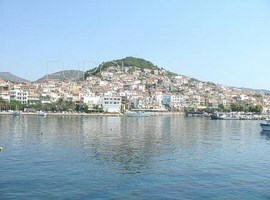 The capital of the island is Mytilene and the entire island has a population of 100.000 residents. The relief of the ground is mainly lowland, it has also low hills and mountains (the two highest, Lepetemnos and Olympus have an altitude of 968m and 967m each). A special feature of the island is the petrified forest of Sigri which includes petrified boles since the tertiary period. The arts and the literature (mainly the poetry) had been greatly grown in the island since the early antiquity. During the 7th century BC, in Lesvos a cultural and artistic growth was turned up which appeared in parallel with the financial growth. Although the cultural centre of the ancient Greece was Athens, the cities of Lesvos had a special and important contribution to the edifice of the ancient Greek civilization. Music and poetry were the most loved occupations for the residents of the island. Some of the most famous musicians of the antiquity were Terpandrus the Antisseus, Arion the Methimnian and Kition the Mytilenean. Terpandrus invented the seven-stringed lyre which was named ‘’varvitos’’ (also known as laouto or violoncello). The lyric poetry was a kind of literature which started in Ancient Greece and especially in Lesvos as the first lyric poets were Sappho and Alcaeus from the island. The lyric poetry expresses personal or emotional feelings and took its name from lyre, the music instrument which accompanied the poems and was very popular in the antiquity. Also, many philosophers and historians came from the island of Lesvos like Pittakos one of the 7 wise men of the antiquity, Hellanicus who tried to classify the historic material of his era and Harris, the historian who was part of the Great Alexander’s campaign and wrote down the facts. Theophrastus from Lesvos, a learner of Plato and Aristotle, he founded with the last the famous ‘’ Peripatetic school’’ and managed it after the death of Aristotle until 287BC. This cultural tradition continued with new representatives as the poet Odysseas Elytis, the prose writers Stratis Myrivilis and Elias Venezis, the painter Theophilus and the painter-sculptor George Iakovides. Mytilene is a city (the capital of Lesvos), built upon 7 hills and carries a huge history. You can see that as the city itself has monuments, houses, churches, schools and other buildings from many different historical periods. 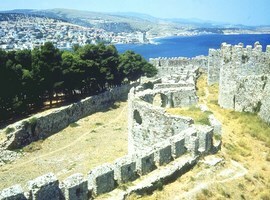 Mytilene is one of the most ancient Greek cities as it was founded in the early 10th century BC. Today, Mytilene is full of excellent restaurants, café-bars, nightclubs, interesting, colourful local shops and warm and very friendly people. 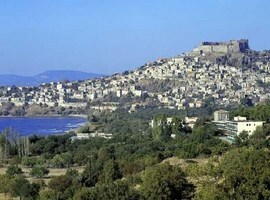 Mytilene is also the home of the University of the Aegean; surely it is one of the greatest places to be a student! The marketplace is one of the most active in Greece with shops for every need and closed to automobile traffic while the stores are open. The prices are low and it’s a very enjoyable experience to buy some stuff there. You can find fresh and very tasteful fishes of the Aegean Sea or to buy salted sardines and combine them with the unique local drink ‘’ouzo’’ (anise-flavoured aperitif). If you taste this drink and you like it, it’s easy to find it around the world as it is one of the most exportable Greek products. In the marketplace, there is a yogurt shop which sells the most incredible yogurt in the entire world. If we talk about eating, you will get impressed by the restaurants and taverns which offer high quality and big variety of food like fishes, meat, pizzas, pasta and the traditional and really famous ‘’Souvlaki’’ at inexpensive prices. Although, the best restaurants are in the old harbour at the end of Ermou Street. An ouzo with a pleasant lunch can last until the evening and the people at the next table who were strangers just a little before, can begin to feel like blood brothers and soul-mates. As in any Greek city, it’s not the buildings or the scenery that makes the place special. It’s the people. 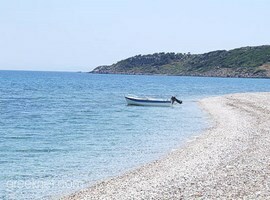 From the beaches of the island, the best one is the Tsamakia beach. Also, many tourists gather at the beaches along the road to the airport (Vigla, Naples and Kratigos). At the centre of the city is the Museum of the Byzantine Art which hosts many valuable exhibits. The castle of the city impresses the visitors with its medieval colours. It was built during the years of the Byzantine emperor Justinian and now one of its sections is used as a place for cultural events during the summer months. At the full of pine trees hill of Agia Kyriaki, the Ancient Theatre since the late Roman years is located. It is considered as one of the biggest ancient theatres with an average capacity of 15.000 people and excellent acoustics. Very famous is the Museum of Theofilos, created by the famed Mytilenean critic Stratis Eleftheriadis and includes 86 paintings of Theophilos. Theofilos as a self-taught painter is the main representative of the Greek folk painting of the 2nd century. The Museum of the Modern Art-Library of Eleytheriades-Teriade are exposed the so-called Great Books (original artwork hand signed and numbered by the artist), but also paintings of Matisse, Miro, Picasso, John Tsarouchis and other painters with an entry fee of 2€. At the northern area of Mytilene a lot of Ottoman monuments are located like the Yeni Mosque, built in 1825 and the Tsarsi Hamam which has been formed as an exhibition centre. Every year, during the summer, the municipality of Mytilene organizes a lot of cultural events under the title ‘’Summer of Lesbos’’. Also, during the first week of August it takes place the ‘’Ouzo Festival’’ where the local producers offer free ouzo to taste it every single one. 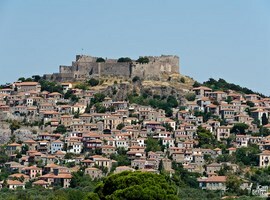 Kalloni is located in the west-central part of Lesbos and has a population of 8.194 inhabitants. The town has a lot of natural beauties like the Gulf waters and the rich plain where 6 rivers flow. The Gulf of Kalloni is protected by the treaty of Natura 2000 and it’s the home and the reproduce place for rare and protected species of birds. The salt lakes of the town host many interesting birds as the beautiful flamingos. It is an ideal place for those who love bird watching. The villages of the municipality are also nice and well-developed in terms of tourism. Parakila village, at the western side of Kalloni, fills the air with the irresistible aromas from the orange groves, while the area also lends itself to the cultivation of the rhododendrons (rhododendron luteum), unique in their kind throughout Europe. The area of Parakila is also known for its woven wool carpets, blankets and rugs. On the Parakila coast there is a wide range of taverns where one can savour all kinds of delicacies. A few kilometres from the western side of Parakila, is located Apothika, the picturesque resort of Agra with its many taverns and the tasty fresh fish. Eressos is the home of the poet Sappho and the naturalist Theophrastus who is considered as the father of the Modern Ecology. It is of unique beauty and attracts thousands of visitors every year. 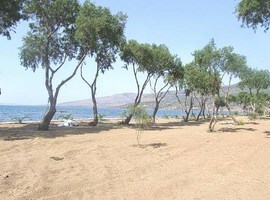 At this western part of Lesvos is located the famous ‘’Petrified Forest’’. This unique place is a Petrified Forest ecosystem made up of hundreds of lying and standing fossilized tree trunks which were covered by volcanic material and petrified there 20 million years ago during the late Oligocene-middle Miocene period. Into the layers of the volcanic ash have been discovered pieces of trunk, branches, roots, seeds and leaves as well as fossilized animal bones. Important quantities of fossilized remains can also be found in the marine and seashore zones of western Lesvos. The Petrified Forest is full of impressive volcanic geotopes which witness the great volcanic activity in the past. Visiting this forest you can imagine how was developed the Aegean over the last 20 million years. The area enclosed by the villages of Eressos, Plomari, Antissa and Sigri exposes large accumulations of fossilised tree trunks comprising the Petrified Forest. 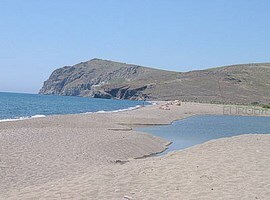 Fossils have been found also in many other places of the island like the villages Molyvos, Polichnitos and Akrassi. The Greek Republic recognises the exceptional geological and palaeontological value of this incredible natural monument and has established the forest as a protected national monument. 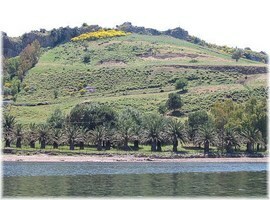 The Petrified Forest of Lesvos has been included in the Global Geoparks Network of UNESCO since 2004. Plomari is the 3rd biggest municipality in Lesvos and its port accepts thousands of tourists every summer. It is special place thanks to its architectural style, its town planning and also for its old industrial buildings as the oil pressers and the soap industries. The produce of the famous and popular worldwide ouzo first started in small distilleries and after the late 19th century they were developed important industrial units with remarkable production for exports. The centre of the cultural life of the town is the ‘’Polycentre’’, an old soap industry which now hosts a hall for events and exhibitions. Very interesting places to visit are the Museum of Ouzo and the Museum of Soap where the people can see old evaporators and instruments for the produce and old documents about the exports and the trade of the products. Plomari is highly developed as a touristic place with a lot of hotel complexes, stores, taverns and traditional shops with folk art products. In Plomari you can find the 7th best Greek beach, the beach of Agios Isidoros which has the certification of the Blue Flag and also they are ideal for sunbathing the beaches of Melinda, Ammoudeli, Agia Varvara and Drotas. The last years work in Plomari a marina with a capacity of 60 vessels. Every summer they are organized many cultural events as the Ouzo Festival, the Nautical Week and the ‘’Veniaminia’’. Plomari and the surrounding villages offer an opportunity for a peaceful atmosphere and a breath-taking view. Agia Paraskevi is a town on the Gulf of Kalloni. It’s a place which can impress the visitor with the large number of the neoclassical mansions, the paved roads, the historical monuments and the popular ‘’Bull Festival’’. This festival is a moveable celebration which takes place 50 days after Easter; it has a duration of 3 days and includes equestrian competitions and all night long spree. In the area of the town there are 64 chapels and churches but this one that makes out is the church of the Pammegiston Taksiarhon which is built in 1856 and it includes a piece of art, the carved wooden chancel screen. You can see also the Museum of the Olive and the stately building of the local School complex in the town centre that was built in 1923 and is a miniature of the Athenian Propylaea. In the settlement, it works an animal shelter especially for wild birds and animals which receive a lot of care, treatment and love from the people who work there until their liberation in their natural environment. Only a few kilometres from Agia Paraskevi, it is located the ancient temple of Messon since the 3rd century BC which was the centre of worship and meeting for all the cities of Lesbos. Thanks to the plenty of archaeological sites, the town is protected as an area with great archaeological interest. Also, it’s a protected natural place as it hosts a wide variety of wetlands with rare and important bird species, rural landscapes, salt lakes, springs and rivers which charm the visitors. 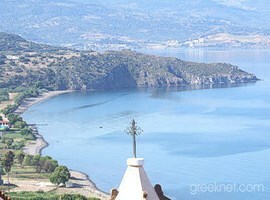 Between East and West, Lesvos is an Aegean diamond which has been characterized ‘’the island of Harmony and Beauty’’. The island is a great combination of natural beauties, rare geological and archaeological monuments, wetlands, museums, special traditional kitchen and of course excellent quality accommodation and entertainment for all. The people who have already visited Lesvos are impressed and fell in love with this island and they continue to visit it almost every year. 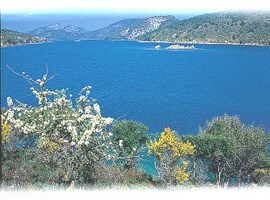 So, if you need something special for your holidays in Greece, think about Lesvos. You will be surprisingly satisfied!